The U.S. military is changing procedures at its jails in Afghanistan following a review prompted by prisoner abuse allegations, the military said Monday, although it declined to give details of the changes. The military is acting on the interim findings of an American general who visited American jails across the country, without waiting for his final report, spokesman Lt. Col. Tucker Mansager said. "We're taking action on those (findings) as they come forward, evaluating them, implementing some of them, deferring some of them and planning some of the rest of them out," Mansager told a news conference in Kabul. He declined to describe the report's suggestions or the changes made. Four British soldiers will face courts-martial on charges of abusing prisoners in Iraq. Attorney General Lord Goldsmith said the charges include allegations of "assault, indecent assault which apparently involves making the victims engage in sexual activity between themselves, and a military charge of prejudicing good order and military discipline." It has previously been reported that Lt. Gen. Ricardo Sanchez, the top U.S. commander in Iraq, had to approve aggressive interrogation techniques like the use of dogs or stress positions. But The Washington Post reports in September, Sanchez approved the use of dogs, sleep deprivation, temperature extremes and other tactics with no approval from outside the prison. When Central Command officials objected, Sanchez issued new rules eliminating some of the methods and requiring that he approve the tactics. Britain's Observer newspaper reports the U.S. government has sent at least 70 detainees into the custody of other countries without due process. In at least two cases involving multiple detainees, the men had been cleared of charges by their native countries' courts before the U.S. detained and transferred them. There are fears the destination countries might torture the prisoners. A group of military intelligence soldiers began reporting abuse at Abu Ghraib in November, The New York Times reports — months before senior officers say they were alerted. One incident involved five former Iraqi generals who were bound, blindfolded and beaten after a prison riot. It was unclear if commanders saw or acted on the reports. Red Cross memos point to knowledge of worries about prison conditions up the Army chain of command, the Daily Telegraph reports. Some Iraqis are resisting a U.S. request to exempt private contractors from local prosecution after the planned June 30 handover of sovereignty. The issue has taken on new meaning after some private workers were implicated in the alleged mistreatment at Abu Ghraib prison. The hiring of those private interrogators may have violated Army policy. A December 2000 memo cites a "risk to national security" if private sector workers were allowed seek tactical intelligence. An Army spokesman says commanders had discretion over the restrictions. Before evidence of abuse surfaced at Abu Ghraib, commanders started cracking down on alcohol use among prison staff, The Los Angeles Times reports. An attorney for Spc. Charles Graner, one of the soldiers accused of abuse at Abu Ghraib, wants to call top Pentagon officials — including Defense Secretary Donald Rumsfeld — as witnesses in his client's upcoming court martial. The top U.S. commander in Afghanistan, Lt. Gen. David Barno, ordered the review last month as the scandal over detainee abuse in Iraq drew new attention to alleged mistreatment in Afghanistan, including three deaths in custody. Brig. Gen. Charles Jacoby, Barno's deputy operational chief, visited all of the about 20 American holding facilities, most at bases in the south and east where 20,000 U.S.-led troops are battling Taliban and al Qaeda insurgents. Jacoby will give his final report to Barno in the coming days, and some of the findings will be made public by early July "after a review process," Mansager said. "It'll come out as a consolidated, cohesive and comprehensive package," he said. Earlier this month, Barno pledged rapid action if Jacoby finds faults in the secretive prison network, but said details of techniques used on suspects will remain classified. Two detainees died at the U.S. military's main Bagram base, north of Kabul, in December 2002. Both were ruled homicides after autopsies found the men had died from "blunt-force injuries." The military says it has made a number of unspecified changes to its prisons as a result of the deaths. But it has yet to release results of its criminal investigations. The death of another detainee in eastern Afghanistan in June 2003 is also under investigation by the Central Intelligence Agency, and the military is probing allegations of mistreatment brought by two former detainees last month — including beatings, the use of hoods and sexual abuse. 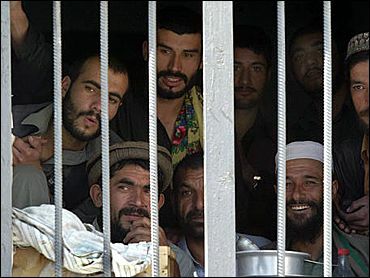 The military says some 2,000 prisoners have been held at the jails since U.S. troops entered Afghanistan in late 2001. At least 390 are currently in custody. Mansager said another 90 people detained during recent military operations in southern Zabul province would be treated with "dignity and respect." Some may be released after initial questioning, while others will be transferred to Bagram, he said. Fierce fighting in Zabul since May 25 has killed more than 80 militants. Detainees from such operations are usually held at local bases and moved to Bagram if they are believed to be Taliban or al Qaeda suspects. Facing pressure to open jails to outside scrutiny, the U.S. military announced last week it would allow the International Committee of the Red Cross to visit its holding facility in the main southern city of Kandahar. It has previously allowed the group access only to the jail at Bagram. The U.S. military has so far refused to allow Afghanistan's human rights commission into any of its prisons.